The 1979 Akron helmet had a gold shell, a white/blue/white stripe sequence, and a logo on the sides of the team name "Zips" (photograph below). I would appreciate a larger and clearer photograph from the 1979 season. *1 This design was first used during Akron's game at Purdue on September 22, 2001, which was the team's second game during the 2001 season. The red central stripe was added "in support of the 'Fire Truck Fund', an effort to raise money...in the Greater Akron area to purchase a new fire truck for the City of New York", following the terrorist attacks of September 11, 2001 (source: the Official Athletic Site of the University of Akron, Sep. 20, 2001). The red stripe was to remain for the rest of the 2001 season, according to the article. *2 Designs 'G' and 'G1' are identical on their left sides, but appear different as seen from the right side. 'G' has a large "kangaroo head" logo at the back of the helmet, off-centered somewhat towards the right side of the helmet. ,'G1' has the 'Z' logo on its right side; below are representations of these two. *3 This design has uniform numerals on its left side only; the right side has a "Z" logo (as represented below). *4 This design has uniform numerals on its left side only; the right side has a "Z" logo (as represented below). *5 This design has uniform numerals on its left side only; the right side has a "Z" logo (as represented below). *6 This design has uniform numerals on its left side only; the right side has a "Z" logo (as represented below). *7 This design has uniform numerals on its left side only; the right side has a "Z" logo (as represented below). *8 This design has uniform numerals on its left side only; the right side has a "Z" logo (as represented below). *9 This design has uniform numerals on its left side only; the right side has a "Z" logo (as represented below). *10 This design has uniform numerals on its left side only; the right side has a "Z" logo (as represented below). *11 This design has uniform numerals on its left side only; the right side has a "Z" logo (as represented below). *12 This design has uniform numerals on its left side only; the right side has a "Z" logo (as represented below). Ball State's 1999 media guide listed the following information for helmets used by the team prior to the period covered by this web site: leather helmets were used from 1924 through 1955, and in 1956 the team used red helmets, each with a single white stripe. The designs shown above are believed to be the complete set for the period covered by this site (1960 to present). *1 Uniform numerals are present on the left side only of this design; the right side features BSU's "cardinal" logo (as shown below). *2 Uniform numerals are present on the left side only of this design; the right side features BSU's "cardinal" logo (as shown below). *3 Uniform numerals are present on the left side only of this design; the right side features BSU's "cardinal" logo (as shown below). *4 Uniform numerals are present on the left side only of this design; the right side features BSU's "cardinal" logo (as shown below). *5 The "BALL STATE" logo is present on the left side only of this design; the right side features BSU's "cardinal" logo (as shown below). *6 Uniform numerals are present on the left side only of this design; the right side features BSU's "cardinal" logo (as shown below). *7 Uniform numerals are present on the left side only of this design; the right side features BSU's "cardinal" logo (as shown below). *8 Uniform numerals are present on the left side only of this design; the right side features BSU's "cardinal" logo (as shown below). *9 The "BALL STATE" logo is present on the left side only of this design; the right side features BSU's "cardinal" logo (as shown below). *10 Uniform numerals are present on the left side only of this design; the right side features BSU's "cardinal" logo (as shown below). To the best of my knowledge the above are all of the different helmet designs used by BGSU since 1960. *1 These two designs are among the more unusual helmet designs I have encountered while working on this website. From the photographs of these that I have seen, it appears that an irregular area of white spray paint was applied to each helmet, and then a template was used to apply an orange falcon over the white area (or, just as likely, perhaps a template in the falcon shape was applied to the helmet first, then peeled off after the white paint was sprayed over it). The white areas had "blurry edges" and varied in size and shape considerably from one helmet to the next, but were placed in approximately the same region on each helmet. Buffalo discontinued its football program following the 1970 season, at which time the team was classified as a "major" one by the NCAA. The program was reinstated at the Division III level in 1977; it moved to Division II in 1988, to Division I-AA in 1993, and to Division I-A in 1999. 1981? - 1983: like 1980 but stripe sequence changed to red/blue/red (or maybe red/white/blue/white/red). Additional information about the missing helmets would be appreciated. I would need only a color photograph in order to add the 1969-1970 and 1977 helmets to the site. Some photographs from the 1964 season show some CMU players wearing a simple "C" logo on their helmets, as in the photograph below. It is unclear if this logo was ever used by most of the team simultaneously, so I have not (for now) included it in the list of helmet designs above. Otherwise this is believed to be the complete set of historical helmet designs for CMU for the period covered by this web site (1960 to present). *1 Uniform numerals are worn on the left side only of this design; on the right side is the "C" logo (hence the right side looks like design 'G' above). Through the 1990 season EMU's teams were known as the "Hurons"; hence the logos on the pre-1991 helmets. *1 During 1991, the "100" logo was worn on the left side of the helmet for the entire season in recognition of the university's 100th season of football. The big "E" was used on the right side of the helmet during both 1991 and 1992; during 1992, the left side of the helmet was left "blank". *2 The "E" logo was worn only on the left side of this design; on the right side were green uniform numerals and a large pale gray outline of the state of Michigan (as depicted below). *3 The "E" logo was worn only on the left side of this design; on the right side were white uniform numerals (as depicted below). 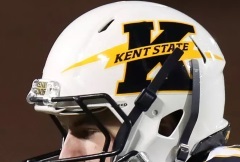 During three games in 2017 Kent State used a new helmet logo, a large "K" with a "lighting bolt" across it bearing the school name (as in the photograph below). Other versions of this logo were worn on blue and yellow helmets. I have been unable to locate the artwork for this helmet decal, so I would greatly appreciate a copy of the artwork for it from anyone who has access to it. *1 Kent State used a version of the "100" logo during at least part of the 1969 season. The decal was placed at the bottom rear of the helmet and consisted of a dark-colored football shape with a white outline and with the numerals "100" in white. *2 All photographs I have seen of the 1973 helmets appear to show the "KSU" logo as having an elliptical shape, as opposed to the football-shape of the logo used during the rest of the 1971-1975 period. *3 At least three different stripe variations were used during the 1990 season. Photographs from game #2 vs Akron show helmets with no stripes; two yellow stripes bordered by very narrow blue stripes can be seen on the helmets in photographs from game #7 vs Ohio; and for game #3 vs Western Michigan, the helmets appear to be the same as those used in 1989, 1991, and 1992 (with a single blue stripe). I would appreciate hearing from anybody who can clarify which design was used during Kent State's other games in 1990. *4 During the entire 2014 season Kent State wore the number "54" on the right side of each helmet (as shown below) in memory of team member Jacob Bitsko, who died unexpectedly of natural causes on August 20, 2014. 54 was Bitsko's uniform numeral. Miami's team nickname was "Redskins" prior to the 1997 season. *1 Worn vs Middle Tennessee State during the 2011 GoDaddy.com Bowl game in Mobile, AL. The 'M' logo is present on the left side only of this design; uniform numerals are worn on the right side (as represented below). *2 The large "hawk head" logo is worn on the left side only of this design; on the right side are red uniform numerals (as depicted below). *3 Helmet design 'E' has the "M" logo on both sides; 'E1' and 'E2' have the "M" on the left side only. On the right side, 'E1' has a "ribbon" logo in one of nine different colors; these ribbons were chosen by each player and recognize those affected by different types of cancer. Below are representations of these designs. 'E2' has uniform numerals on its right side (as represented below). The dates of use for several of the earlier designs shown above are uncertain - clarification would be appreciated for these. *1 NIU used black helmets with white numerals on the sides by at least 1965; I do not have much information yet from the years before then. *2 Gray facemasks may have been used with this design during the earlier years of its use. *3 Some photographs that I have seen from the early 1980s suggest that NIU was using helmets of a darker shade of red than is shown here, perhaps a crimson color similar to that presently used by Oklahoma or Alabama. To the best of my knowledge the above are the complete set of historical helmet designs for Ohio for the period 1960 to 2012. *1 During the 1969 season, a version of the "100"/football shaped-logo was worn at the bottom rear of the helmet. The football shape was some dark color, and the numerals were apparently white.
? - 1961? 1962? 1963? 2015: N-A-I; A-O-I; I-O-I; A-P-I (the last game being vs Temple in the Boca Raton Bowl at Boca Raton, FL). 'A' was also in use during the September 3 home game vs Stony Brook which was canceled at halftime following a lengthy lightning delay; this game is offically a "no contest". 2014: A-A-F; F-I-I; I-F-J; K-L-A; M (the last game being vs Arkansas State in the GoDaddy Bowl at Mobile, AL). Toledo's helmet history is unclear for the earliest years covered by this web site (early 1960s). The team apparently used white helmets from at least 1960 through 1966. Judging from a very small number of photographs it would appear that these white helmets had a single dark stripe in 1960 and 1961 (probably blue, if the school colors have not changed); a single photograph from 1962 shows numerals on the sides of the helmet (otherwise like 1961); and in 1963 a "rocket" logo different from the 1964-1966 one was used (photo below). Numerals of unknown color are also visible at the back of the helmets in all available clear photos from 1963 through 1966. The 1973 helmets were similar to the 1967 - 1972 version shown above, but for a different decal being used; the logo was a small, light-colored football shape that probably contained a picture or letters or something - the photographs that I have are not nearly clear enough to show what's inside (below is the clearest photo I have received). The 1974 helmets were apparently dark blue with a single light-colored stripe and with no decals on the sides. The stripe was probably either white or yellow, but a color photograph would be necessary to clarify. *1 Worn January 4, 2015 during the GoDaddy Bowl at Mobile, AL (vs Arkansas State). Uniform numerals were worn only on the left side of each helmet; on the right side was a dark blue shape like that of the state of Ohio containing a yellow "rocket" logo (as represented below). 1984 1985 - 1992 1993 - ? 2013: C-D-D; C-E-C; C1-G-C; D-E1-F.
Helmet design 'W' (used September 24, 2016 vs Georgia Southern) has a brown shell with three gold stripes and a gold 'bronco' logo on both sides (picture from video of the game below). I have been unable to locate the artwork for this alternate bronco logo and so would greatly appreciate a copy of this logo from anyone who might have it. (This is apparently the same logo worn on the right side of design 'C2' - see note 1 below. In 1974, Western Michigan's helmets were of some light color, apparently either yellow or gold, and had a stripe sequence of brown-white-brown. No decals are visible in any of the photographs that I have seen of this design. *1 Design 'C' has the bronco head logo on its left side only; on the right side are brown uniform numerals (as depicted below). Design 'C1' has the bronco head logo on its left side only; on the right side is a different logo - a brown bucking bronco (photograph below) - I would appreciate a copy of the artwork for this logo. Design 'C2' has the bronco head logo on both sides. *2 Design 'D' has the bronco head logo on its left side only; on the right side are white uniform numerals (as depicted below). 'D1' has the bronco head on both sides. *3 Design 'E' has the bronco head logo on its left side only; on the right side are gold uniform numerals (as depicted below). 'E1' has the bronco head on both sides. *4 The bronco logo is present on the left side only of this design; on the right side are pink uniform numerals (as depicted below).